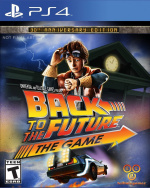 Telltale's largely forgotten adaptation of Back to the Future appears to be riding shotgun in a snazzy silver DeLorean to the PlayStation 4. 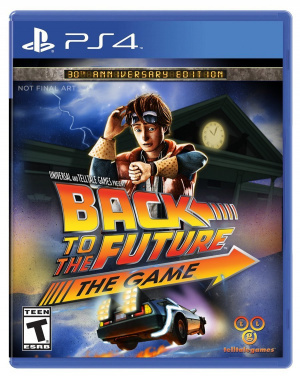 A product page for the episodic escapade – which originally deployed on the PlayStation 3 four years ago – popped up on Amazon overnight, alongside some mock-up box art. The cover includes a reference to the franchise's 30th Anniversary, while the description mentions the addition of a Behind the Scenes video with the game's makers. Assuming that the listing is accurate, the title will release on 13th October for the budget price of $19.99. The original movie, of course, hit the silver screens back in December 1985 – three years before this author was even born. Hands up if you're feeling old yet. The game itself picks up after the events of Back to the Future Part III, and fits the mould of more traditional Telltale titles, where you're solving simple point-'n'-click puzzles to progress. Will you be taking the tour through time to give this a try? Show us your crazy kicks in the comments section below. Was this any good? I've just realised that I own it but have never actually played it. @get2sammyb the film or the game? I loved it, it's a great companion piece to the movies too. Great telltale storytelling, it's let down a little technically sometimes but nothing game breaking like jurassic Park. @get2sammyb Three years before you were born? And you feel old?! I usually end up bored playing these type of games but I really enjoyed BTTF. Then again I'm also a huge fan of the movies. This is actually the only Telltale game I've managed to finish. I'm still in the middle of The Walking Dead and don't know when I'll get around to finishing it. What the flux. Loved it. @get2sammyb I was 5 when this movie came out, so don't feel too old. And 'yes' the game was pretty good, but I think you really had to be a fan of the movies. There's many hidden references in there and many background images of items from the movies. Christopher Lloyd is great, reprising the role, and the actor they got for Marty was a dead ringer for Michael J. Fox's voice...even somewhat looked like Michael J. Fox if you watch the behind the scenes. The only thing that could have been better, was the graphics and adding more original actors to it...I don't think the guy who played Biff is doing anything, so they could have gotten him. Besides that, the game was pretty good for it's time, but I don't know what changes will come onto the PS4 edition, if any. Do keep in mind both he and I are huge Back to the Future fans- we grew up with the movies. I'm sure that affected his opinion, at least to some extent. @get2sammyb my wife has played every season of every telltale game starting with Walking Dead season 1. She loves them. As for Back to the future, she tried it but couldn't get past the first episode as the puzzle solving was a lot more complicated and she gave up. Not necessarily going to be the case with you, but I thought I'd add that feedback. Never knew this existed, no interest despite loving the movies. I really liked the series, always wanted a season two. The film released the year I was born. I'm definetely feeling a bit old. Bought the game on PS3 when it was 0.99 in a flash sale, but never played it. I love the films and telltale, so I think it's about time to give it a go. I got it when it released on the PC. It was a lot of fun. Not sure I'd pay for it again though I would be happy if it came up in PS+ some time in the future.